Plantation forests of Australian hardwood species in South-East Asia now exceed 7 million hectares, and the viability of these plantations is increasingly threatened by diseases and pests. Workshop participants at the Biological Control workshop in Indonesia. 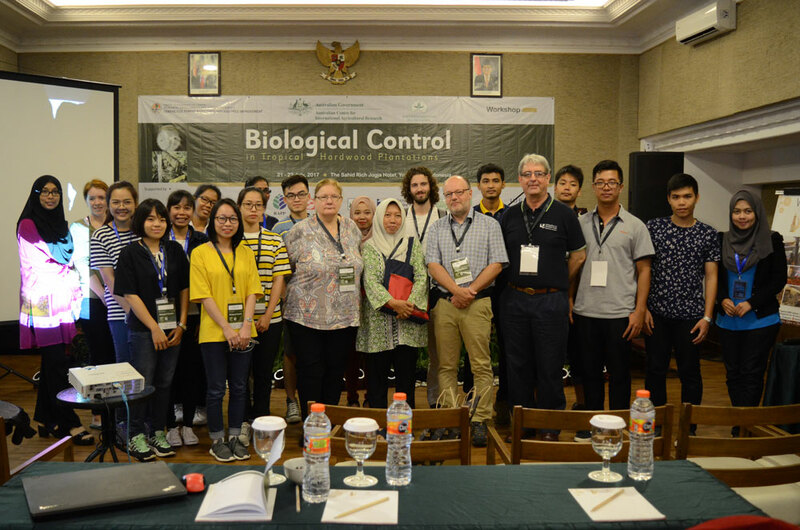 Thanks to the Crawford Fund and the Australian Centre for International Agricultural Research, 70 participants from around Southeast Asia and Fiji met in Jogjakarta, Indonesia for a workshop on biological control as a sustainable option for the management of these pests and diseases. Held recently, the workshop brought together over 14 facilitators from around Australia, Indonesia, Vietnam, Fiji and Thailand, with the aim of exploring myths and realities of biological control in forestry, the regulatory framework for biocontrol and how to critically evaluate success or failure in hardwood plantations in Southeast Asia. Focused on introducing the general concepts of biocontrol, the biocontrol of fungal pathogens and biocontrol strategies against invasive insect pests, the workshop featured 3 keynote speakers: Marc Kenis from the Invasion Ecology and Risk Assessment Section, CABI, Switzerland; Simon Lawson from the University of the Sunshine Coast, Australia; and Caroline Mohammed from the University of Tasmania, Australia. In an effort to reduce the impact of productivity limiting diseases in Acacia plantations, the workshop was designed to provide training in the development and application of biological control technologies for insect pests and fungal diseases in tropical tree plantations. A simulation exercise for all participants focused on a practical interactive exercise in decision-making following the introduction of a new exotic insect pest into a plantation estate. 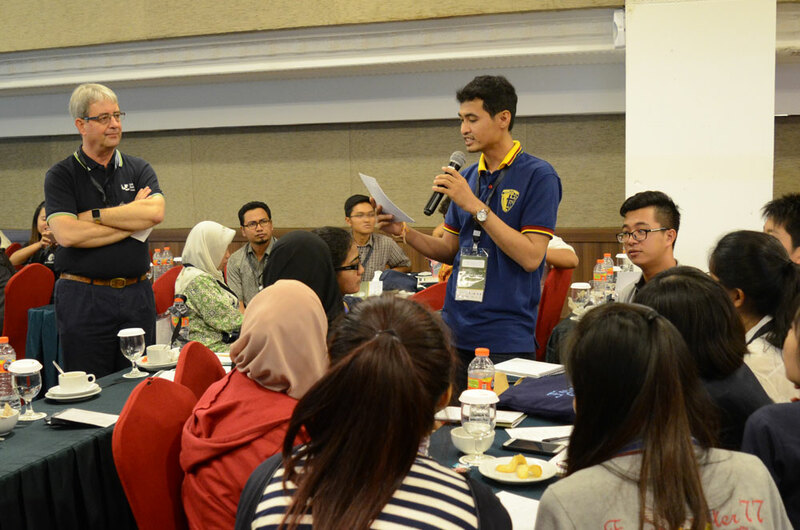 A series of decision points were outlined for group discussion to reinforce the concepts of classical biocontrol and its regulatory environment and to increase participants’ confidence in making appropriate decisions about biocontrol, all in line with the goals of building capacity and collaboration on forest health in Indonesia. While feedback from participants was overwhelmingly positive, the urgent need for regional collaboration in both biocontrol and biosecurity research and implementation was highlighted. Bringing together representatives of the major public-sector research organisations from Vietnam, Indonesia, Cambodia and Myanmar countries, universities in Indonesia and Thailand, and major industry partners in Indonesia, an additional goal of the workshop was to establish and nurture professional networks among forest health workers in Southeast Asia and beyond. With workshops like this critical in assisting in establishing and nurturing the relationships required for increased levels of collaboration, training facilitators noted a willingness amongst participants to find new ways and funding to collaborate in research that will improve biosecurity for partners in both Southeast Asia and Australia. In a positive step towards this, following the workshop, feedback from participants indicated that they would either extend the scope of their biocontrol research or adopt a collaborative approach to insect pest and disease management.